Dermatitis is an inflammatory condition of the skin often occurring as a result of exposure to ionizing radiation during radiation therapy for a variety of malignancies or as a result of exposure of the skin to irritants. Common symptoms range in severity and include redness of the skin, wet or dry desquamation, edema, and ulceration. There exists an unmet clinical need to develop treatments specific for radiation- or chemically-induced dermatitis. In these cases, dermatitis is often treated in the same manner as thermal burns, although there are significant differences in their molecular mechanisms. Current treatments are often palliative and do not prevent recurrence. Patients are typically prescribed moisturizing creams or corticosteroids to treat dermatitis. 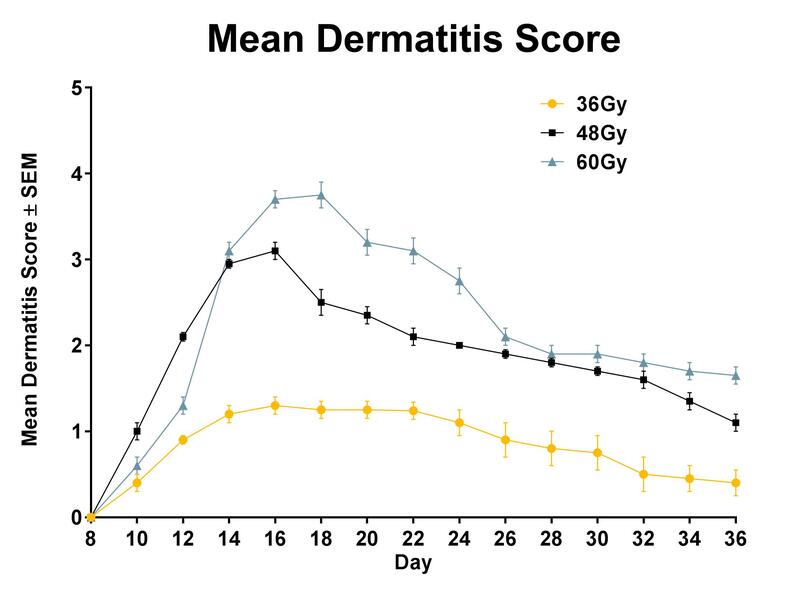 Biomodels offers an acute model of radiation-induced dermatitis. 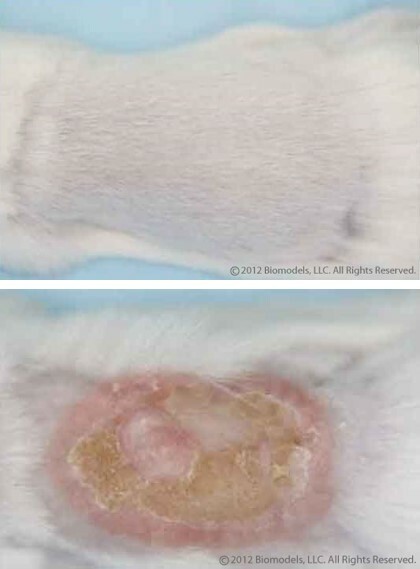 The back of the mouse is shaved and/or depilated and the skin is temporarily tented such that it can be selectively targeted with radiation while the rest of the mouse is protected by a lead shield. Mild erythema is typically observed 8-10 days following radiation exposure. Disease severity peaks between Day 12-16 with desquamation of approximately 50% of the irradiated area and often ulceration of the tissue. 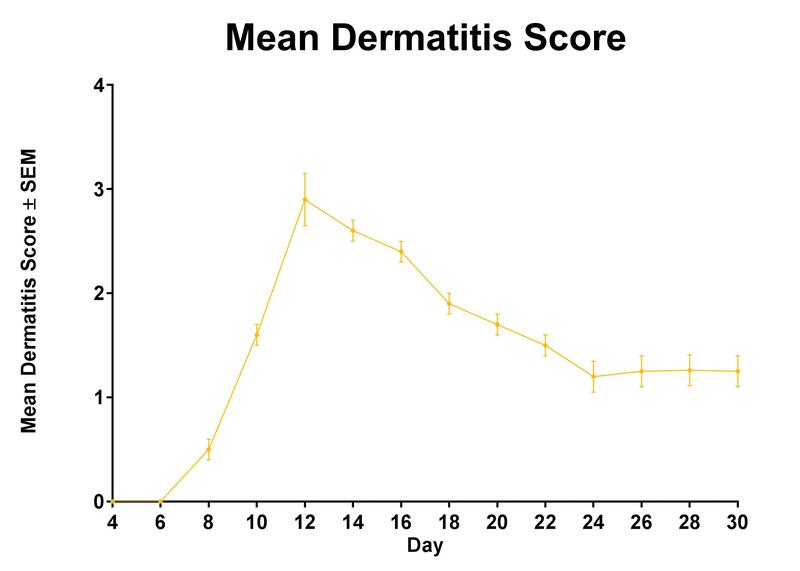 Endpoints in this model include dermatitis severity scores (based on a standardized scale representative of the clinical assessment) combined with histological analysis at both peak of disease and study termination. 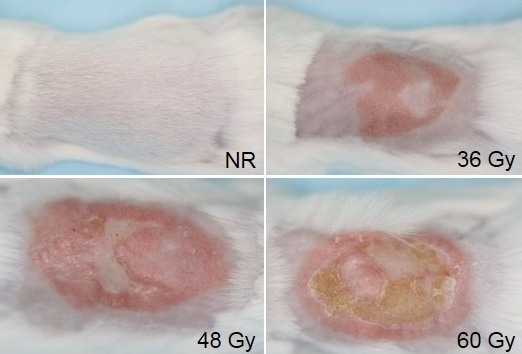 Like in the acute model, the back of the mouse is shaved and/or depilated and the skin is temporarily tented such that it can be selectively targeted with radiation while the rest of the mouse is protected by a lead shield. Animals receive 6 fractions of radiation on a schedule of 3 days on, 2 days off. The progression of disease is quite similar to what is observed in the acute model, with mild erythema typically observed 8-10 days following radiation exposure, disease severity peaking between Days 12-16 (depending on the dose of radiation), and with desquamation of approximately 50% of the irradiated area. Endpoints include dermatitis severity scores and histological analyses. Contact Dermatitis due to exposure to metal ions such as nickel occurs in approximately 10% of the population. Patients suffering from this allergy to nickel are unable to wear jewelry or handle metal objects. 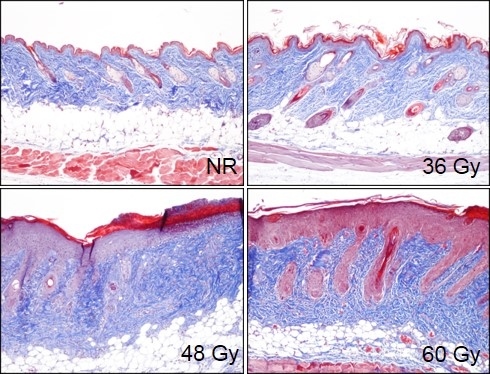 Biomodels offers a mouse model of nickel dermatitis where animals are sensitized to nickel by applying a nickel solution to the shaved abdominal region of the mouse. Mice are then challenged with an injection of a nickel solution into the rear footpad. This allows mice to be screened for nickel sensitivity. Only mice that display an inflammatory reaction to the injection of nickel are used in the study. Following this screen, the nickel solution is again applied to the abdominal region and the presence of dermatitis is scored over the following three days. This model reliably produces desquamation of 25-50% of the affected area. For a full description of this model see the publication below.